Evictions can happen to any landlord no matter how well a tenant is screened. Circumstances change in people's lives and they are not able to pay the rent. This is especially true when people lose their jobs, go through a divorce, or have a serious injury. When tenants aren't able to pay the rent, they also find it difficult to move. When this happens the landlord has to go through a costly procedure of evicting the tenant. So, how and when can a landlord legally evict a resident? 26 Fun Things to Do for Mother’s Day in Austin, Texas. 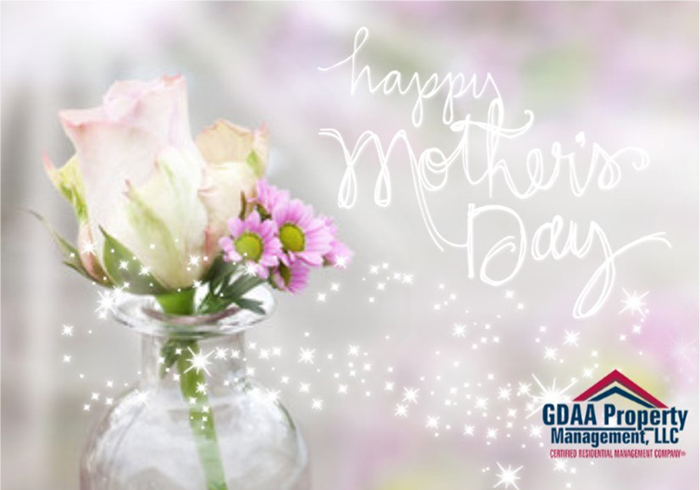 It's Mothers day weekend, what are your plans to celebrate with Mom? Maybe get outside, soak up some Austin culture and be adventurous, or simply take Mom to brunch. Local author Rebecca Darling, shares some great ideas to help you spend time with Mom this weekend. Jen Sorensen of GDAA Property Management, talks to Jason and Ian of Integrity Mechanical, LLC about their 10-year business partnership with GDAA and how it has benefited countless GDAA tenants and clients. Integrity Mechanical, LLC has been in the business of providing excellent A/C and heating services within Austin and the surrounding areas since 2007. They are renowned for conducting their business with professional ethics, which is why GDAA Property Management is proud to work with them in providing clients with the best A/C and heating services. GDAA is one of Integrity Mechanical LLC's priority customers, which means GDAA tenants get the best pricing and priority service when they need it. They are very considerate of your time, making it a rule to give you a 30-45 minute heads up before they go to your place. This excellent business partnership is an indication of how much we value our tenants and owners because we don't settle for anything less than the best. We work with vendors that work as hard as we do when it comes to making you happy. So, if you are on the look-out for high-quality and expert property management services or want to check out available #GeorgetownHomesforRent, please don't hesitate to give us a call or visit our website. Thank you for watching! 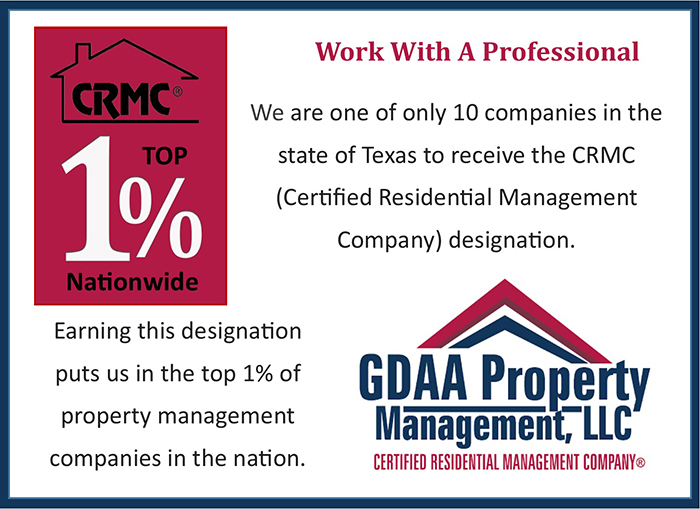 The Certified Residential Management Company designation is awarded to professional property management firms that demonstrate a high standard in both procedures and customer service. A detailed examination of the company and recommendations from clients and peers are required for this designation. GDAA Property Management, LLC obtained this esteemed designation October 20, 2015. In this video, Greg Doering, owner/broker of GDAA Property Management, shares some tips on how to make the transactions smoother and how to close the sales easily when you are working with a buyer of an investment property with an existing tenant. The first thing you need to do is make sure the tenant understands that even with the property being bought or taken over by a new owner/landlord, the lease will still be in force until the specified expiration. You need to assure your tenants that they don't have to move out just because the property is being sold. Next, you need to transfer the security deposit to the new owner. Make sure you have full and accurate accounting when the transfer takes place, so that both the buyer and tenant are protected. This is done to ensure that there will no problems forthcoming when the tenants vacate the property. You will also need to disclose the full security deposit amount. Pro-ration of rent is the next step. The existing seller owns the property until the day of sale, so if the tenant is paid for the full month, they are entitled to all the rental proceeds until the day of sale. Once the property is turned over to the new owner, the new landlord gets the remainder of the rent. Make sure the tenants are given the new owner's contact information at the time of closing or a little beforehand. They need to know where to address the rental proceeds to, or who to call for maintenance issues and other emergencies. You may also want to obtain a copy of the tenant's application. This is in case something goes wrong later, more specifically, in case you need to do collections. Applications usually have pertinent information on the tenant, such as crucial phone numbers and their Social Security number. Lastly, try to obtain a full accounting of the tenant in the property. Make sure their payment history is on file, if there's been any concessions made for late payments, and if they pay on time. This helps the new owner get to know the tenant and their payment history. We hope these tips help you and your buyer make that smooth transition. If you're in need of expert property management services, sage property management advice or want to check out our available #ApartmentsinLeanderTX, please don't hesitate to call or visit our website. Thanks for watching! 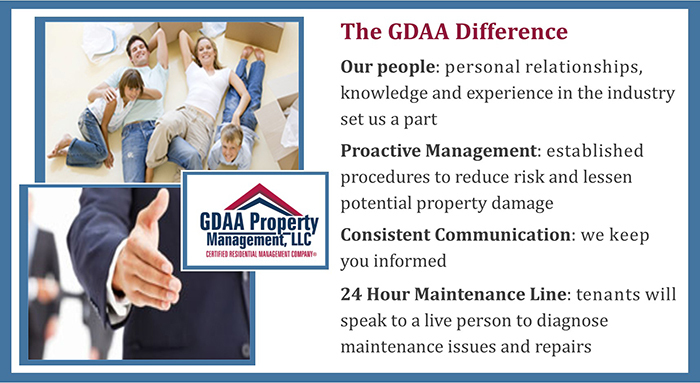 Experience only the best and professional property management in Leander TX with us at #GDAAPropertyManagementLLC! Learn more about us and our services at http://www.gdaapm.com/leander-property-management. Are you finding enough ways to provide stand-out service to your Georgetown owners and residents? Continue reading this article and see how the GDAA difference stacks up. 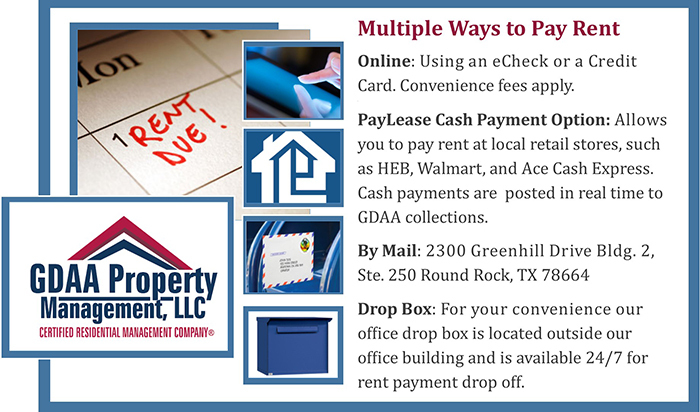 One of the most common landlord problems in Round Rock is nonpayment of rent. On occasion, landlords will be faced with a difficult tenant who refuses to pay rent. 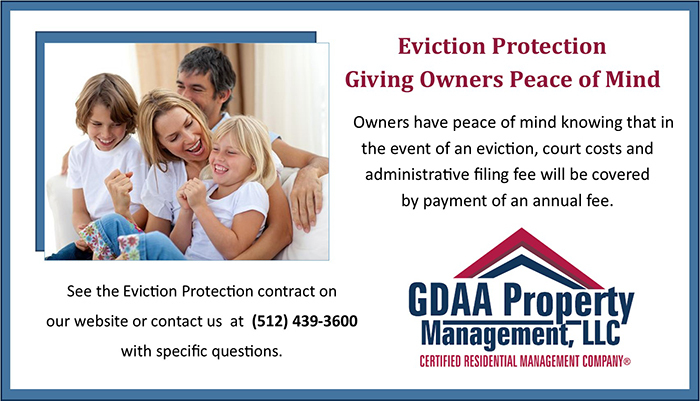 GDAA Property Management makes it easy for tenants to submit monthly rent payments. To avoid "problem tenants" we recommend Kyle Property Manager be on the look out for these red flags throughout the tenant screening process. Vacancies often breed anxiety among landlords. The desire to fill a unit quickly can sometimes get in the way of finding the perfect tenant. However, this could be a costly mistake. Bad tenants miss payments, damage property, and can be downright miserable to deal with. The first reason is, we have an option that allows the agent to list a property for lease, and we only come into the picture once the tenant has been secured. Since leasing is a big part of an agent's business, they usually go for this option. We wouldn't dream of taking away an agent's opportunity to serve their clients. So you can go ahead and list the property for lease, we take over for management and as always, if the property goes back on the market either for lease or for sale, we will return it to you. We don't compete against you. We never have and we never will. Once you refer a property to us, we enter your name in our software program and whenever that property comes back on the market for lease or for sale, we notify you. All clients referred to us by a particular agent are referred back to them. It's very important to note that we don't do sales and we will always refer everyone and everything back to you. Last but not the least, we pay you on time. We believe you work hard and that is important to us, so once the tenant has moved into the property, we issue you a check on the Thursday following the date they moved in. We know you worked hard, so we believe that you need to be compensated in a timely manner. We value your referrals; we value working with you. We're here to make you look good. If you are in need of excellent property management services, sage property management advice or want to check out our available #HuttoHomesforRent, please don't hesitate to call us or visit our website. Thank you for watching!